The latest estimates of telephone coverage by the National Center for Health Statistics found that a quarter of U.S. households have only a cell phone and cannot be reached by a landline telephone. Cell-only adults are demographically and politically different from those who live in landline households; as a result, election polls that rely only on landline samples may be biased. Although some survey organizations now include cell phones in their samples, many — including virtually all of the automated polls — do not include interviews with people on their cell phones. (For more on the impact of the growing cell-only population on survey research, see “Assessing the Cell Phone Challenge,” May 20, 2010). It is possible to estimate the size of this potential bias. 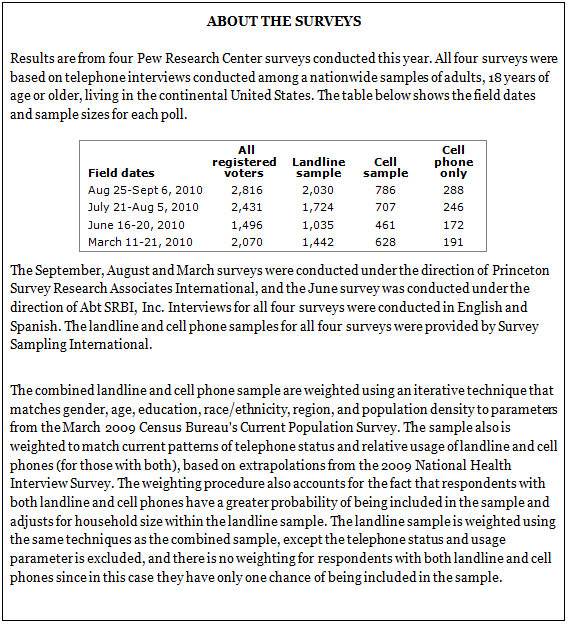 The Pew Research Center for the People & the Press conducts surveys with samples of landline and cell phones, which allow for comparisons of findings from combined landline and cell interviews with those only from landline interviews. Data from Pew Research Center polling this year suggest that the bias is as large, and potentially even larger, than it was in 2008 (See “Calling Cell Phones in ’08 Pre-Election Polls,” Dec. 18, 2008). In three of four election polls conducted since the spring of this year, estimates from the landline samples alone produced slightly more support for Republican candidates and less support for Democratic candidates, resulting in differences of four to six points in the margin. 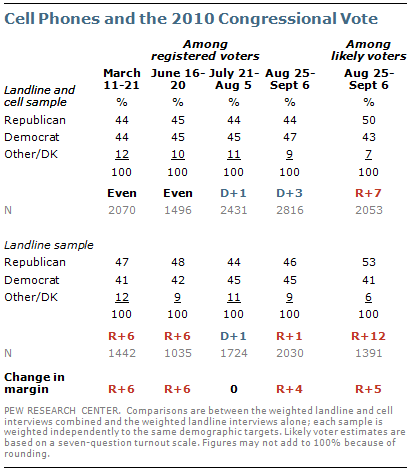 One poll showed no difference between the landline and combined samples. In the Pew Research Center’s latest poll, conducted Aug. 25 to Sept. 6 among 2,816 registered voters, including 786 reached by cell phone, 44% said that if the election were held today that they would vote for the Republican candidate for Congress in their district or leaned Republican, while 47% would vote for the Democratic candidate or leaned Democratic. Among the landline respondents, 46% preferred the GOP candidate and 45% the Democratic candidate, a four-point shift in the margin. In this survey, both estimates would have shown a close race between Republicans and Democrats. Limiting the analysis in the survey to those considered most likely to vote in this year’s elections, a similar bias is evident. The combined landline and cell estimate produced a seven-point Republican advantage: 50% supported the GOP candidate for Congress in their district while 43% backed the Democratic candidate. The Republican lead would have been 12 points if only the landline sample had been interviewed, a significant difference from the combined sample of five points in the margin. Significant differences also were seen in March and June of this year. In those surveys, Republicans and Democrats were tied among registered voters in the combined sample of landline and cell phone interviews; in both surveys Republicans had a six-point lead among landline respondents. In the survey conducted July 21-Aug. 5, there was no difference in the estimates produced by the combined sample and the landline sample alone. After the Nov. 2 elections, the Pew Research Center will release a comprehensive analysis of the cell phone issue, which will include the Center’s final pre-election survey. How Serious Is Polling’s Cell-Only Problem?